Our home’s interior is something that is always changing. There’s barely a time when you’re not redecorating a room because the process can drag on. Whether it’s the master bedroom or the bathroom, you’ll want your home to look its best for yourself and any guests you entertain. Sometimes finding the right style or design can prove tricky and creating the perfect finish will often need the specialities of a professional. This is where interior painters and decorators come in, able to transform any room, adding a touch of class and sophistication, whilst taking your wants and needs on board throughout the entire process. Whether you want painted walls as a quick and easy way to transform your rooms, or wallpaper for the stylistic approach, interior experts are able to create any design you want. All you’ll need to do is discuss what look you’re after for your home and they’ll take your thoughts onboard, providing the perfect aesthetic appeal for your property. 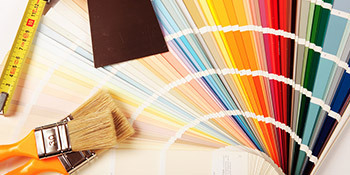 For the best interior painter and decorator rates, comparing quotes is your best option. This will ensure you receive the right price and a high quality service. If you’re interested in adding value to your home and improving the aesthetic appeal of your property, complete our quick form below. We’ll then match your enquiry with up to four of our very best painters and decorators so you can receive FREE quotes from these vetted and reputable professionals. Project: Sanding and re- sealing external cedar cladding and first floor window sills with Osmo oil (provided). Would guess a day of work needing ladders. Project: Plaster all walls of a bedroom and paint. Wallpaper 1 feature wall. Project: Making good after minor water damage and redecorating of dining room approx. 130sqft. Project: Paper & paint walls, gloss doors and skirting. Their quote was clear and concise. They were very good , moving furniture etc. WELL DONE. Only had to make 1 enquiry to get several quotes. Bit of a delay between contacts though. Homes are given an energy rating based on just how efficient they are and ratings are shown in the data underneath. This ranges from A, by far the most energy efficient, to G, the least efficient. With a higher rating you're more likely to have more affordable energy bills as more heat will likely be kept in the house. You are able to enhance your home's efficiency with insulation such as upvc double glazing, loft lagging or wall cavity insulation. There are several types of property in the UK and the data below highlights the type of houses within Uk. Throughout the country the most popular property types are typically semi-detached and terraced housing, yet detached homes, flats and bungalows are also available. The data underneath gives an indication to the number of homes in Uk which are central heated and non-central heated. Properties are heated by a number of sources which indicate how costly yearly energy bills are going to be. Examples of central heating include gas, electricity, oil, solid fuel and LPG boilers. Changing exactly how your home is heated could see you with cheaper bills. The data underneath shows the spread of homes heated by various fuels. Throughout the UK the most common hands down are gas heated homes, followed by electricity and then oil. Biomass central heating boilers are also growing in popularity, heated by green products like wood pellets or agricultural waste.|Homes in Britain are heated by a range of fuels, such as gas, electricity, oil, solid fuel and LPG boilers. Each fuel has a varying cost associated with it so you could find yourself with more affordable energy bills by changing how your house is heated. Even solar thermal panels are being considered by many people as a way to lower heating bills for the years to come.